Welcome to Feminist Cooking For All! 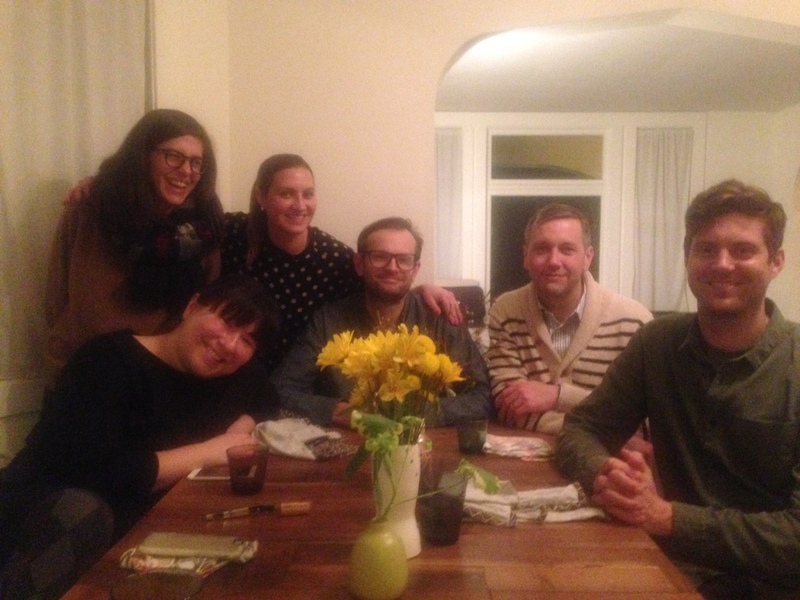 Small classes of 7 people will meet weekly at my house with the intention of learning how to cook! All meals will be vegan and gluten free + nutritious and with a source of protein! Classes are open to men and women in hopes to create a community where we all know how to create nourishing meals! The thoughtful on line book Good and Cheap is great, I thought I would share it. In it are great tips on basics to keep in your pantry and grocery shopping tips - to stay on a budget! The following recipes are a guide ... I hope that you enjoy them! Saute onion in olive oil until translucent, add ginger. Add all other veggies, garbanzo beans and tofu. In a bowl, whisk peanut butter, coconut milk, curry paste, and vegetable broth (optional) until combined and pour over veggies mix - simmer until the veggies are tender. Serve in bowls with either brown rice or quinoa. Garnish with fresh cilantro. *if you freeze your tofu, then defrost it and press all of the excess moisture out, it will be more absorbent and tasty in this dish! I used this recipe! Yum! Cut up cauliflower, toss in olive oil and roast with garlic cloves at 400 degrees until tender (15-20 minutes). 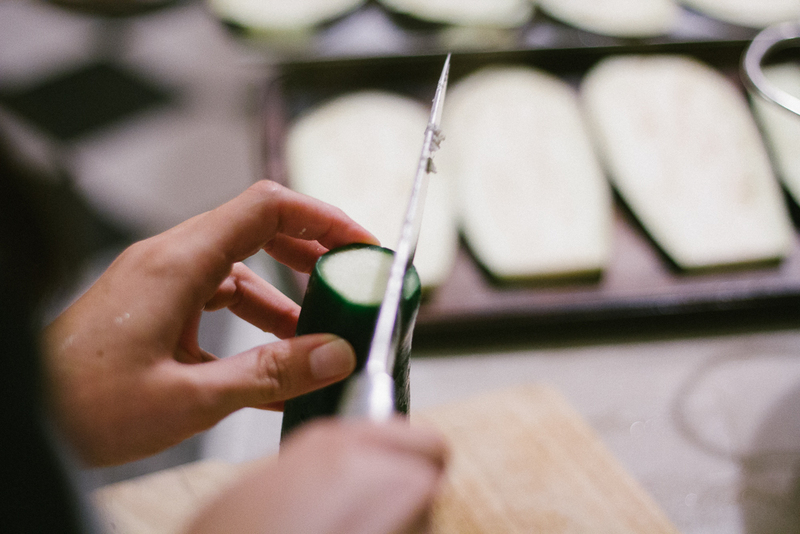 Slice eggplant and zucchinis lengthwise into 1/4 inch slices (8 each). Place on a baking sheet and bake in 400 degree oven until wilted but not mushy (parbaked). Once cauliflower is cooked, put it in a food processor along with all other filling ingredients and puree until smooth - add salt and pepper to taste. Pour 1/2 of the marinara sauce and spread on the bottom of a 9 x 13 in pan. 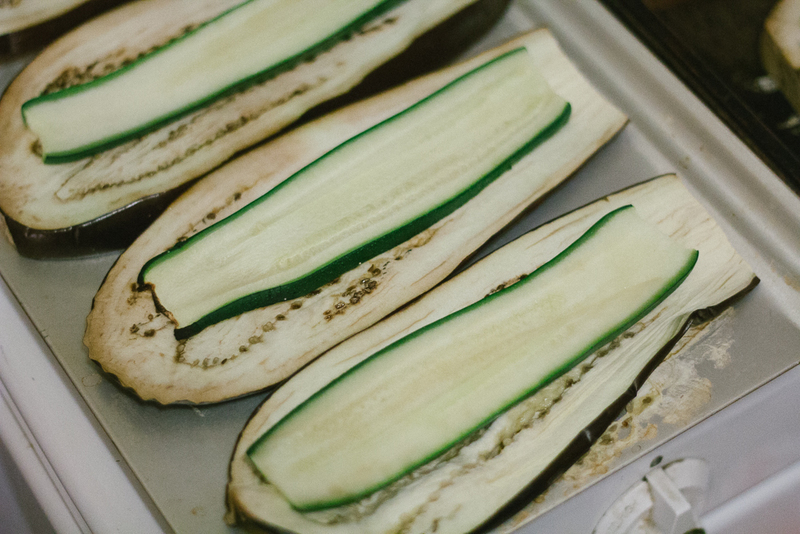 Layer the zucchini on top of the eggplant and dollop the filling onto one half and fold over. Place "fold overs" on the marinara sauce in the pan. Top with the sliced mushrooms, drizzle with olive oil, salt and pepper and a dollup of marinara sauce on each fold over. Bake in oven at 400 until hot and boiling (about 30 minutes). Drain can of garbanzo beans, drizzle olive oil into can and shake beans to coat - pour the beans onto a foil lined pan, sprinkle with salt and pepper and bake until crispy (15-20 minutes). Meanwhile, wash kale, cut spines out and cut into small bite size pieces. Put kale into a large bowl, sprinkle with salt and "massage" the kale until bright green and tender. Slice the fennel into very thin slices (I like to use a mandolin) - add to kale along with the almonds. Mix all dressing ingredients until well combined and emulsified. Toss salad in dressing and top with the garbanzo "croutons"
Rinse and drain brown rice. Heat rice, water, salt and oil in pan until boiling, then, immediately turn to low and cover with a well fitting lid. Patiently let it cook without opening the lid for 40 minutes. Heat about a tablespoon of oil in a pan (coconut oil is great, any oil will work) along with the mustard and cumin seeds- once the seeds begin to pop, add the chopped onion, minced garlic, ginger and minced jalapeño. Once the onions are translucent, add the lentils, tomatoes, bay leaf, rest of the spice mix and water. Keep on a low medium heat and stir occasionally. Add more water if needed. Once the lentils are cooked, add the greens (they should only take a minute or two to cook) and salt to taste (don’t over salt, you can always add more, but you can’t take it away. 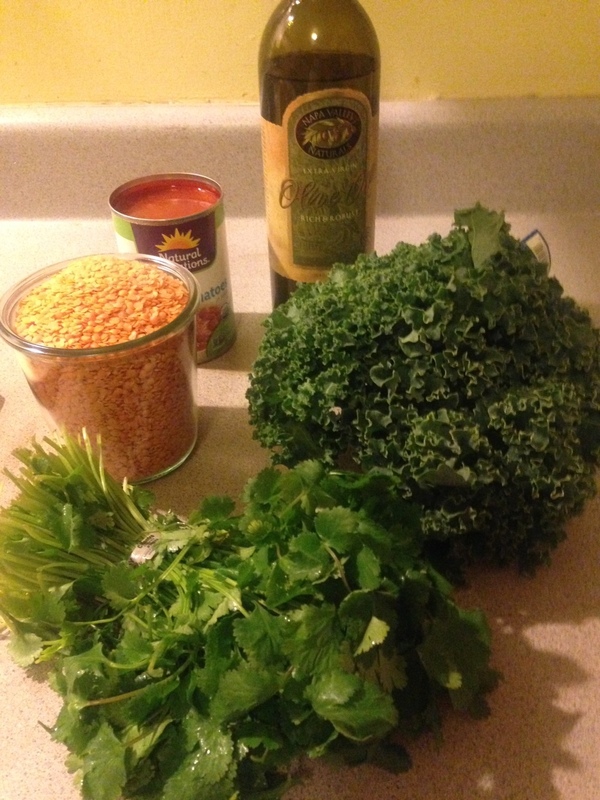 Top with fresh cilantro and serve over brown rice. Leftovers can be frozen to eat later! 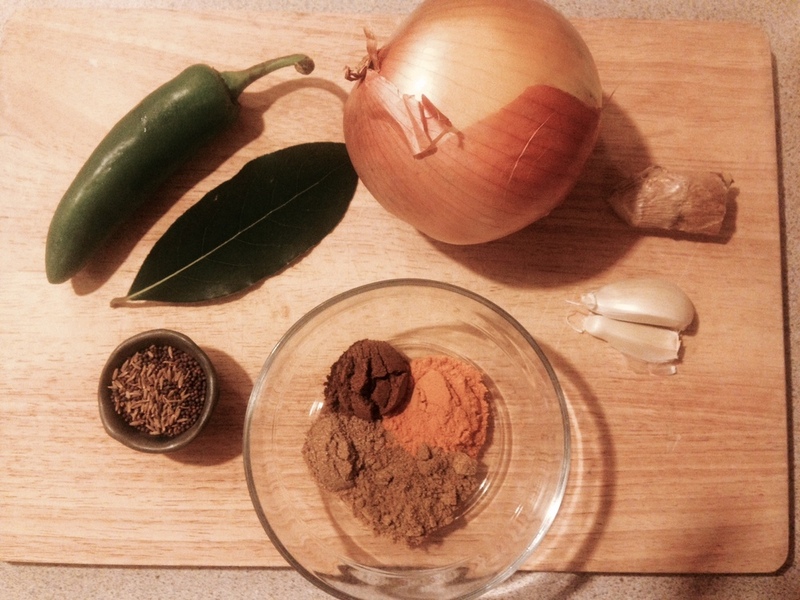 ** The spice mix used for this recipe can be used to make all sorts of things to add Indian flair! Basically heat the seed mix until they pop, add an onion and sauté, then add some other ingredients and the rest of the spice mix. Put all ingredients in a food processor or blender and mix until mostly smooth. Serve on top of curry - yum!! Combine all ingredients besides coconut in a food processor and process until all ingredients are broken down and well combined - mixture should stick when pressed together. Form into balls and roll in the coconut flakes. Wonderful served with Chai tea! Go crazy with these! … you can use raw almonds instead of cashews. You can also add other dried fruit like dried apricots, prunes, goji berries, raisins etc … Try adding some coconut oil or almond butter to help make them stick together - add cacao bits and/or cocoa powder. Roll them in cocoa powder or cinnamon! Be creative - they make a great guilt-free sweet snack! I keep mine in an air tight container in the fridge … but I think they would be ok at room temp too.